Say hello to your new #BeanFF! It’s no secret the Instant Pot and dried beans were made for each other. To celebrate this perfect friendship, we’re giving away an Instant Pot and your favorite Camellia beans, each week now through 5/26/18. CLICK HERE TO ENTER and get extra entries by sharing the love with your BFFs! You could be cookin’ delicious bean dishes in half the time, but with all the flavor. Good luck! 1. 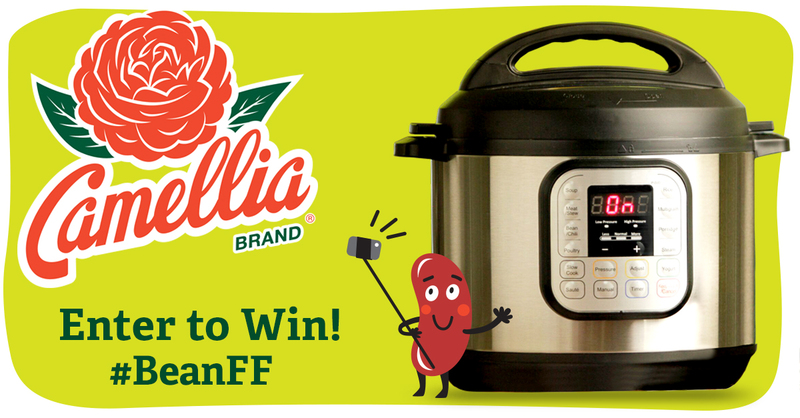 Promotion Description: The ‘Instant Pot + Camellia Beans Giveaway!’ (“Sweepstakes”) begins on 5/14/2018 at 06:15 AM (Eastern Time (US & Canada)) and ends on 05/20/2018 at 12:00 AM (Eastern Time (US & Canada)) (the “Promotion Period”). By participating in the Sweepstakes, each entrant unconditionally accepts and agrees to comply with and abide by these Official Rules and the decisions of (“Sponsor”), which shall be final and binding in all respects. Sponsor is responsible for the collection, submission or processing of Entries and the overall administration of the giveaway. Entrants should look solely to Sponsor with any questions, comments or problems related to the Sweepstakes. 5. Online Entry: Enter the Sweepstakes during the Promotion Period online by signing into the entry form and perform the tasks provided. The entry form can be found on the following website at: http://www.rafflecopter.com/rafl/display/b4f489f86/? 8. Winner’s List: To obtain a copy of any legally required winners list or a copy of the Official Rules, send the applicable request and a self-addresses, stamped, #10 envelope to cc: Instant Pot + Camellia Beans Giveaway! at . Request must be received no later than 48 hours + 6 MONTHS for the name of the winner and, by the end of the promotion, for a copy of the rules. Camellia Brand is in no way affiliated with Instant Pot.